This is the view siting on the Overlook Terrace today between meetings at Ridgewood Country Club in Paramus, New Jersey. It is the most idyllic setting with the beautiful manicured greens and fairways and all of the old growth trees. The pool is off to the left and in the evening, members relax in the Adirondack Chairs adjacent to the practice green. Pilot Nakimi Falcon fountain pen with Noodlers Ink, Pelikan watercolors in a Stillman and Birn Alpha Sketchbook. Tonight we attended an annual cigar dinner hosted by one of our clients The Venitian in Garfield, NJ. An amazing event with over a 1,000 attendees. The food is fantastic and more than you have ever seen. This is just one of the tables with roasted vegetables only. 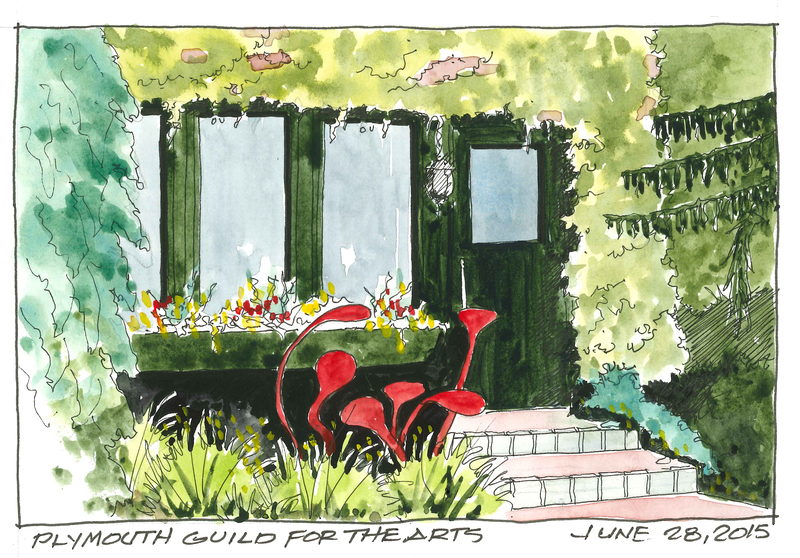 The event raised over $200,000 for the New Jersey Police Benevolence Association. Pilot Namibia Falcon fountain pen, Noodlers ink, Pelican watercolors in Stillman and Birn . 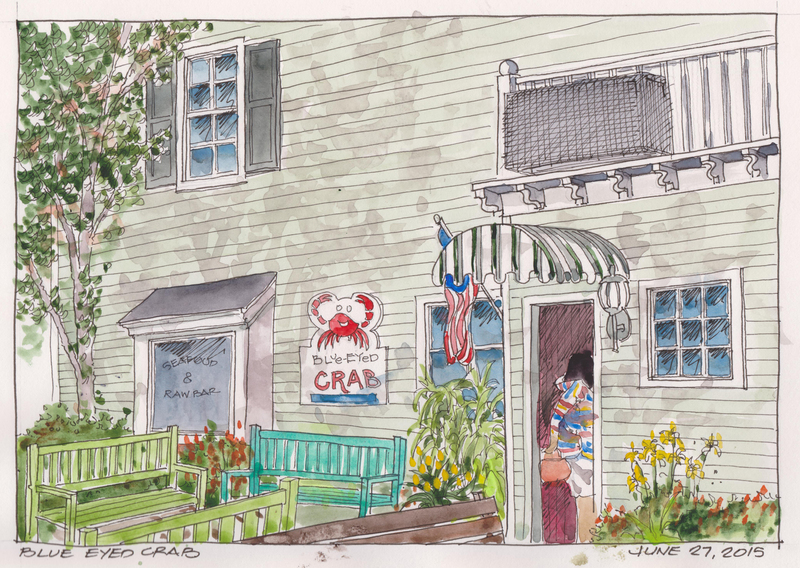 Another sketch of our favorite restaurant, the Blue Eyed Crab in Plymouth, Massachusetts. Such a wonderful restaurant with amazing seafood, great location, wonderful staff and a Fantastic Chef/Owner, Jim Casey in the Kitchen. This is the view of the entry off of the village courtyard with the late day shadows cast from the trees onto the façade. This is actually the first time I have partially captured my wife Lisa in a sketch as she steps inside the door. 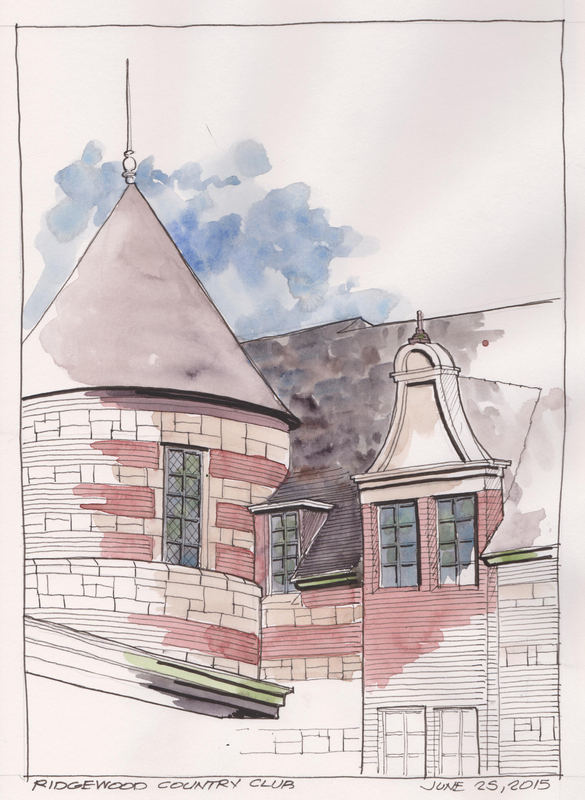 Utrecht Watercolors, black Pitt line work in an Alpha Series Stillman and Birn Sketchbook. 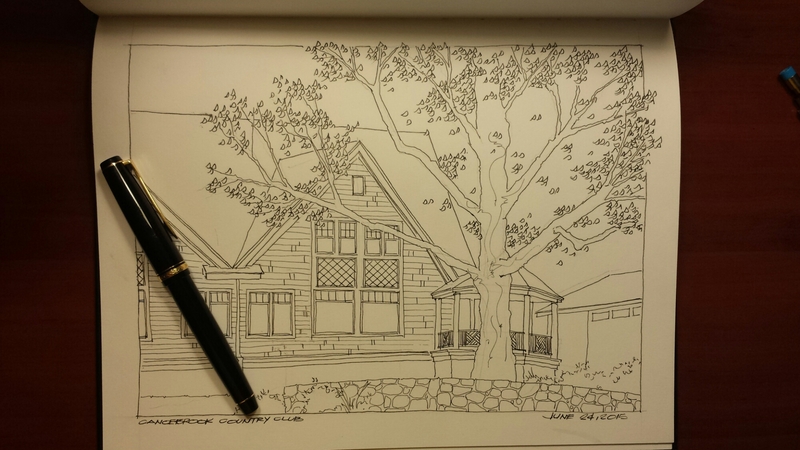 Surprisingly it has taken almost a half of year and 176 sketches to sketch our house. 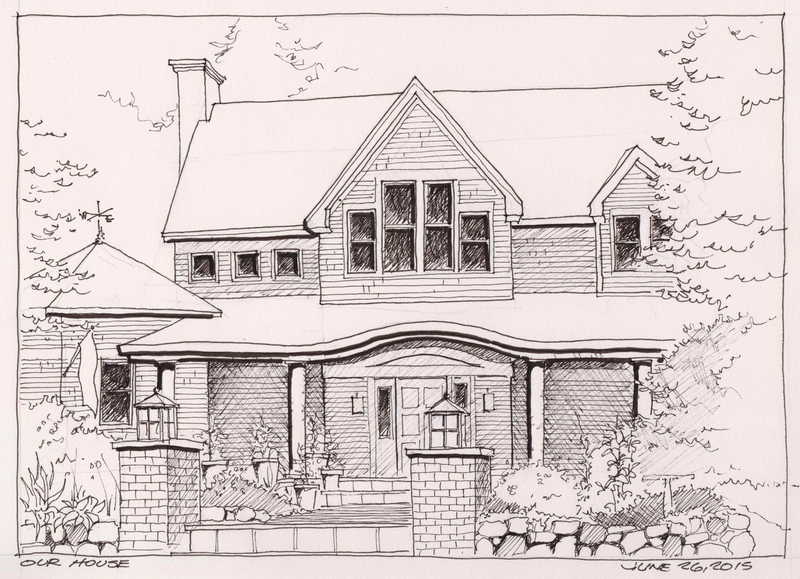 Beautiful day to relax on the front porch after this sketch. Faber-Castell Pitt Art pens in a Stillman and Birn Sketchbook. Another day in New Jersey for work. This is another view of the front façade of Ridgewood Country Club in Paramus, New Jersey. The club is beautiful and has just been listed on the National Registry of Historic places along with all 27 golf holes. The original structure was designed by architect Clifford Wendehack and the golf course was designed by Albert Warren Tillinghast, the preeminent golf architect of the 1920s. 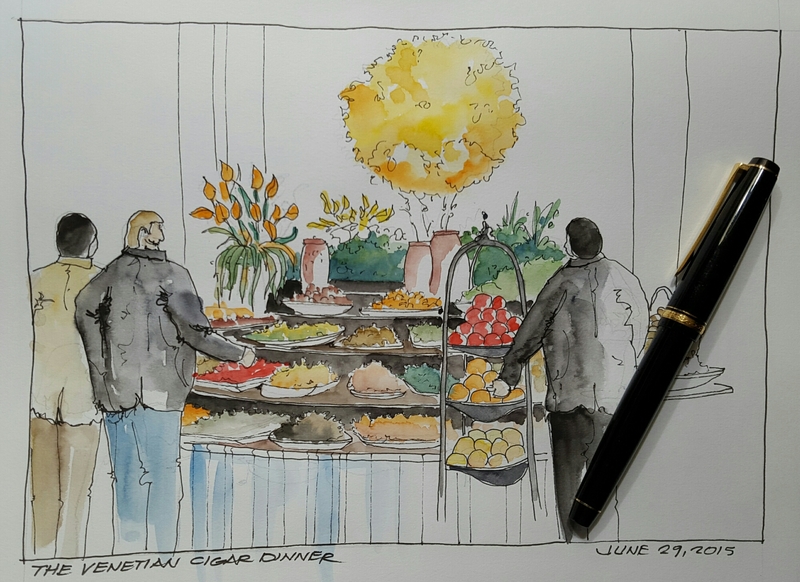 Faber-Castell Pit pens, Utrecht Watercolors in an Alpha Series Stillman and Birn Sketchbook. 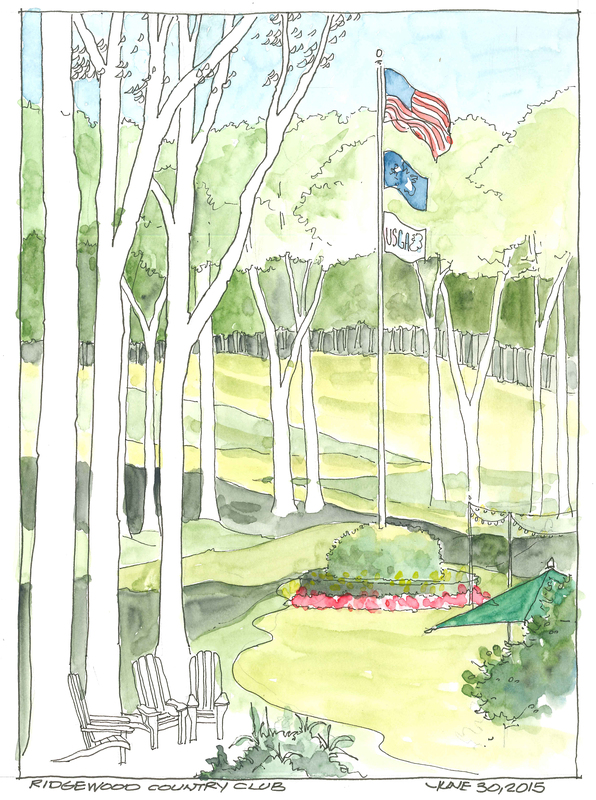 Site visit to Canoebrook Country Club today in Millburn, New Jersey. One of my design projects at Judd Brown Designs/Jefferson Group Architects. The project will be complete in July. Rear deck and gazebo. Pilot Namiki Falcon fountain pen with Noodlers Ink and a Stillman and Birn Sketchbook.